Mining frequent tri-concepts from folksonomies is an interesting problem with broad applications. Most of the previous tri-concepts mining based algorithms avoided a straightforward handling of the triadic contexts and paid attention to an unfruitful projection of the induced search space into dyadic contexts. As a such projection is very computationally expensive since several tri-concepts are computed redundantly, scalable mining of folksonomies remains a challenging problem. In this paper, we introduce a new algorithm, called Tricons, that directly tackles the triadic form of folksonomies towards a scalable extraction of tri-concepts. The main thrust of the introduced algorithm stands in the application of an appropriate closure operator that splits the search space into equivalence classes for the the localization of tri-minimal generators. 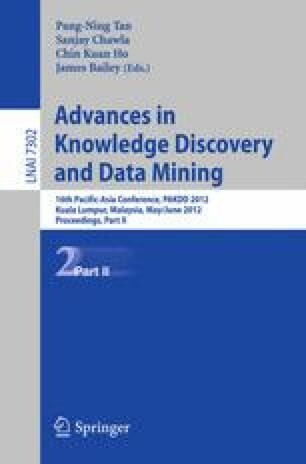 These tri-minimal generators make the computation of the tri-concepts less arduous than do the pioneering approches of the literature.The experimental results show that the Tricons enables the scalable frequent tri-concepts mining over two real-life folksonomies.